Theodoulos Gregoriou, having already participated in Aperto seven years earlier, presented a series of video-sculpture installations under the general title Systeme Global, on which he had been working since the early 90s. 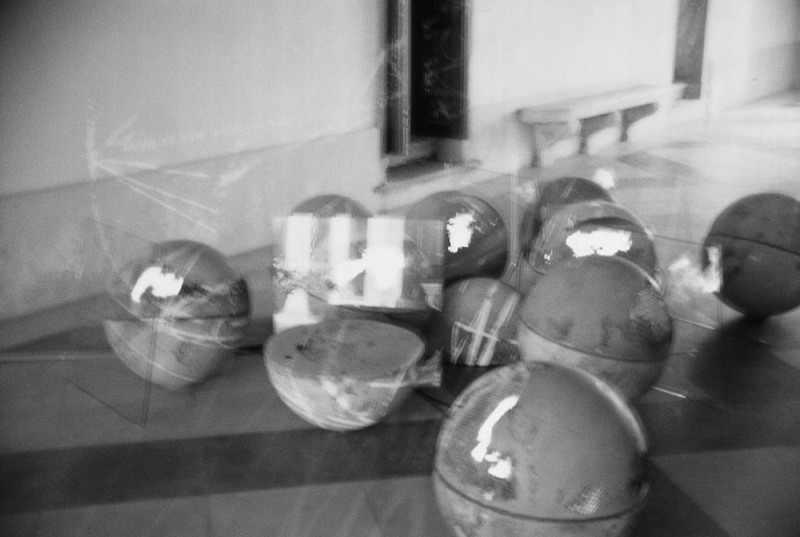 These installations, consisting of cement spheres, pieces of glass, TV monitors and slide projections, appeared in different combinations each time, always negotiating a certain philosophical worldview characterizing much progressive work of the 80’s and 90’s, relating to logic, physics, meta-physics, and human existence in the era of post-technology. Lefteris Olympios, based in Amsterdam since 1986, presented a series of variably sized canvases. The Philoxenia (Hospitality) project had been inspired by a 14th century Byzantine icon depicting Abraham’s meal with the three visiting angels, a favourite image from the Old Testament which the artist had connected with everyday rituals of rural Cyprus. Olympios would often borrow themes from the island’s Byzantine tradition and folk culture, as well as its recent political history, in order to address, through his work, the subjects of human anguish, memory, spirituality and self-knowledge. 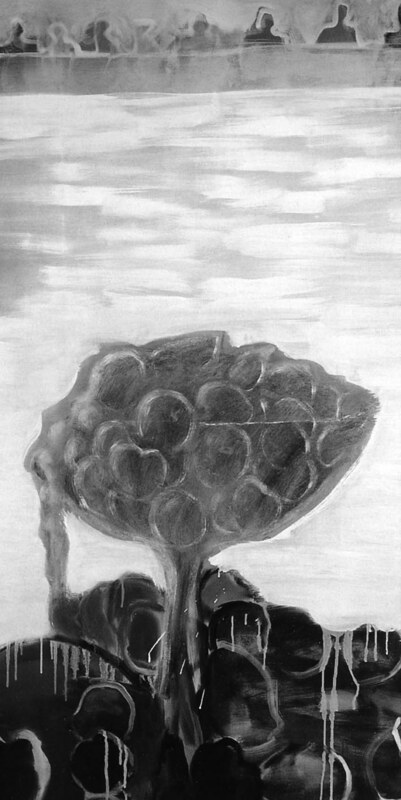 Manifestly political, Nikos Charalambidis’ proposal was flamboyantly constructed in his characteristic style through a variety of media, ranging from prints and sketches to the direction of tableaux vivants and the production of large-scale installations; the complex narratives generated via this cataclysm of symbols and visual dilemmas were inspired by the artist’s favourite sources – the history of art and architecture, contemporary geopolitics and his wild imagination – asserting his self-assigned role as an acute socio-political analyst with an aversion to convention and a taste for the surreal. Among these narratives, memories and facts related to Cyprus’ recent history and current political life had a central role. 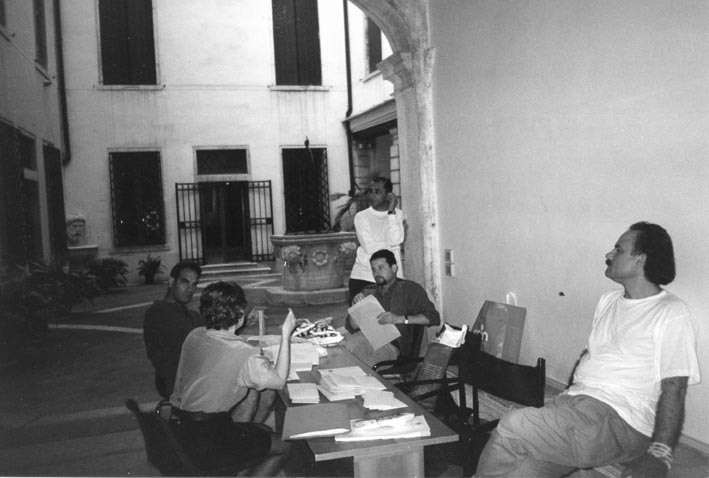 Charalambidis was also chosen to represent Cyprus in the 2003 Venice Biennale. In this exhibition, Charalambidis has merged both participations in a single presentation, faithful to his singular, ongoing conceptual quest. 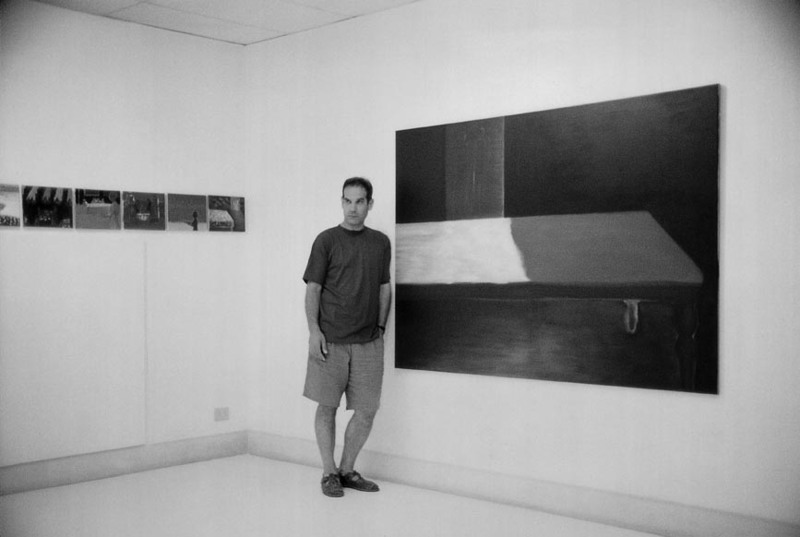 Savvas Christodoulides was trained in Toulouse and Paris, and up to that point he had shown his work in a good number of solo and group exhibitions in Cyprus, France, Germany, England and Greece. His contribution was made up of delicate hand-made, life-size compositions, created out of everyday materials like clothes, cardboard boxes, photographs and canvases; through subtle interventions like cut-outs, embroidery and simple juxtaposition of contrasting textures, he produced a series of ephemeral sculptures depicting shapes or outlines of trees, animals, objects and humans, suggestive, through their discrete occupancy of volume and dimension, of an emotional state of absence. Most of these fragile works have not survived. For this exhibition, the artist has created a number of smaller-scale models based on his old designs, showing next to two of the original, large-scale pieces. The artists and the curator, Eleni Nikita, during the preparation of the exhibition. Nikos Charalambidis, Installation Shots - Details from the artist's work, 1997. 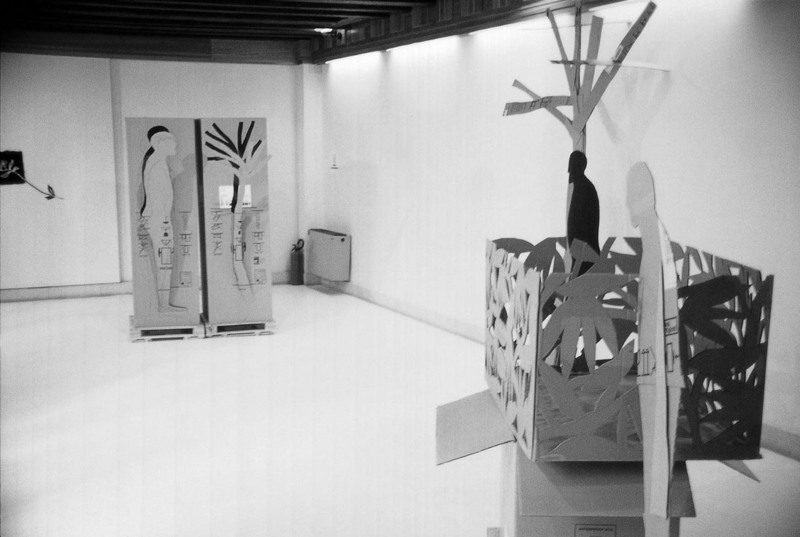 Savvas Christodoulides, Installation Shots - Details from the artist's work,1997. Lefteris Olympios, Installation Shots - Details from the artist's work, 1997. 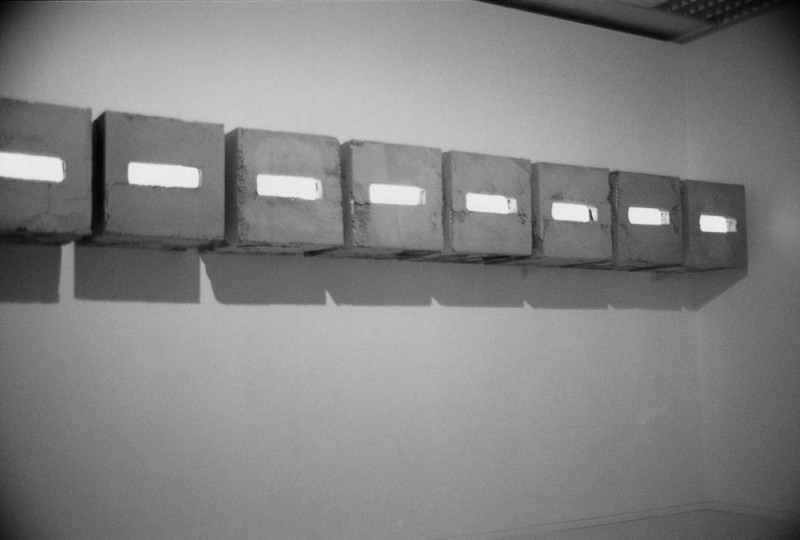 Theodoulos Gregoriou, Installation Shots - Details from the artist's work, 1997. Installation Shots - Details from the artist's work, 1997. Installation Shots - Details from Savvas Christodoulides' work, In the Garden, 1997.